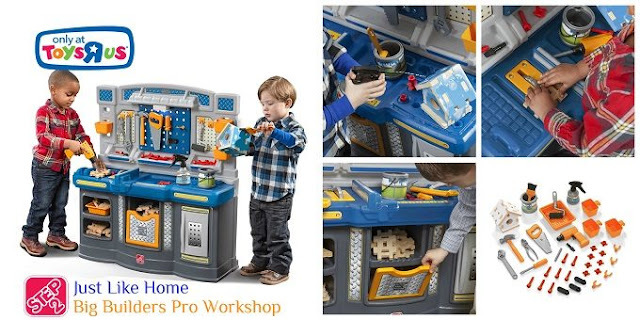 If your children love pretend play and building, the Just Like Home Big Builders Pro Workshop is the perfect toy for them! Amber from Viva Veltoro just reviewed this new Toys "R" Us exclusive workshop from Step2 and her daughter has been having a blast with all of the cool features. Be sure to check out her review to see it in action! To celebrate this awesome new workshop, we've teamed up with Step2 to give one away! Here are some details of the Just Like Home Big Builders Pro Workshop from Step2: The Just Like Home Big Builders Pro Workshop by Step2 features the realistic and authentic sounds of the workshop for hours of pretend play fun! Little ones can work together to create a color-changing birdhouse while working to develop their fine motor skills as they cut, drill and hammer. This kid's workshop is perfect for little handy men and women! Made in USA of US and imported parts. Accessories made in China. Exclusively available at Toys "R" Us! One lucky reader will win a Step2 Just Like Home Big Builders Pro Workshop, ARV $129.99! Open to the Continental US only, ages 18 and up. Ends 9/28/16 at 11:59 PM. Enter using the Giveaway Tools form below. Good luck!